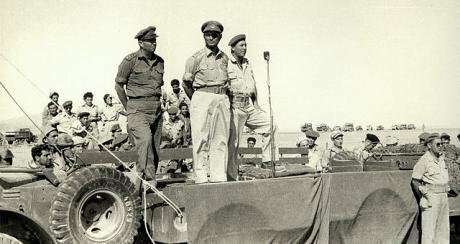 Asaf Simchoni, Moshe Dayan and Avraham Yaffe in Sharm El Sheikh, 1956. wikicommons/IDF. Some rights reserved.Derby Day 50 years ago saw me in the nearest betting shop to the BBC’s Lime Grove studios. I was actually on stand-by for Panorama, just in case the Israeli authorities allowed any TV crews in to cover the conflict in the Middle East that had broken out the previous Sunday. The original idea had been that I would accompany President de Gaulle on his proposed visit to Auschwitz, but he had cancelled as soon as the fighting started, leaving me, freelance reporter Andrew Mulligan and a specially hired freelance French cameraman at a loose end. So that Wednesday, bag packed and waiting, I was at liberty to continue my profitable enthusiasm for the latest hot partnership in horseracing. Trainer Noel Murless had started the season with a new stable jockey to replace the prodigious Lester Piggott. George Moore was a veteran from Australia, and his unfussy efficiency in the saddle quickly earned the loyalty of Murless followers (his namesake, Ryan, currently displays the same style and effectiveness, for the all-conquering Aidan O’Brien). Moore had edged Royal Palace a short head in front of the French-trained colt, Taj Dewan, at the finish of the 2,000 Guineas – the 8-furlong classic race that provides the most important pointer to the 12-furlong Derby itself. Now, at odds of 7-4, he and his mount carried the additional burden of my season’s accumulated winnings. I was sweating more than either of them as they crossed the line. Gripping a large roll of five pound notes, I made my way back to the Panorama offices, where I was a junior director. In fact, technically, I was still a trainee. Having joined the BBC “as if I were a General Trainee” (the Corporation’s personnel officers noting that I was two years below the minimum age of 21), I had yet to find an opportunity to apply for an actual staff position as an Assistant Producer – the first step towards having full responsibility for a transmitted television programme. My first task after joining the BBC in 1964 had been to write scripts for the European Service at Bush House, which included forecasting the results of various events at the Tokyo Olympics. As producers, in turn, took their summer holidays, I was assigned to their desks, where my first action was to open the bottom left hand drawer and extract the manuscript of whatever book they were writing in BBC time. That was how I read large parts of one of George Hills’ volumes on the Spanish Civil War, long before it was published. I had actually quite often sneaked into the Bush House canteen during my time as a student, taking breaks from ploughing through back editions of the Economic History Review in the LSE library (closer to my London home in vacation time than my Cambridge college). Being there as part of the BBC was an entirely different experience. Now I could soak up the lunch-time wisdom of Tosco Fyvel, Ludwig Gottlieb, Konrad Syrop and the other World Service luminaries. Ludwig reputedly spoke eight languages: to my untutored ear, seemingly several at the same time. This felt as close to my imagined post-graduate experience as I could come, once my planned thesis, based at St Antony’s in Oxford, had fallen through, thanks to my supervisor’s transfer to a Vice-Chancellorship. But then the BBC, in its wisdom, decided to second me to the new Centre for Contemporary Cultural studies at Birmingham, under the tutelage of Richard Hoggart and Stuart Hall. Instead of three years researching the replacement of British power by American in Palestine 1944-47, I spent nine months writing extended essays, including a monograph on the concept of public service broadcasting. Immersing myself in the accumulated edicts (and dubious dogmas) of the BBC – and listening to the Centre’s visiting speakers, such as Hilde Himmelweit (the expert on the impact of TV on children) and Dennis Lawrence (who drafted much of the 1962 Pilkington Committee Report on Broadcasting) – might have been designed to “fix” me as a future BBC apparatchik: instead, it made me itch to start making programmes. So I was grateful for my next assignment, as a producer on the Home Service current affairs series, Focus. At Broadcasting House there were yet more brilliant BBC talents at work: Alan Burgess, Keith Hindell, Francis (“Jack”) Dillon and other stars of Lawrence Gilliam’s famed features department. The presenter of my show (I was one of two producers) was Edgar Lustgarten, gravelly of voice and baleful of presence. One edition of Focus, on North Sea oil and gas, almost destroyed my BBC career, barely after it had started. Having recorded an interview with the Minister for Energy, Fred Lee, as part of the programme, I suddenly found myself summoned by his permanent secretary: a North Sea oil rig had collapsed, and the interview needed to be re-recorded. I was to present myself at the BBC Westminster radio studio, with the key, at 9am the next morning. Promptly on the hour, the ministerial limousine swept up, the diminutive minister stepped out, and his Sir Humphrey thrust into my hand “the interview” – a neatly typed set of questions and answers. I was too taken aback to protest. Once the engineer had started recording, I read out the first “question”, and then – as Fred Lee intoned his “answer” – leafed through the rest of “the interview”, flipping back every so often to ask the next “question”. This updated version of government policy, seamlessly edited into the previous version of the programme, improbably impressed one of my bosses for its timeliness. I was too embarrassed to explain that I had cravenly abandoned the BBC’s much-vaunted independence for the sake of expediency. The final “attachment” of my trainee days beckoned: television. A twinkling producer – Terry Hughes, still a friendly presence a few streets from where I live – showed me round the Panorama studio, where the formidable floor manager, Joan Marsden, still ruled with a rasp and a glare. Terry had been working on a series entitled Outlook Europe (whose team affectionately re-titled the show “Look Out, Europe!”), whilst another burgeoning producer, Anthony Smith, lobbied for a series on financial matters. In typical BBC style, Smith was appointed editor of a new programme strand, Europa, whilst Terry (who knew nothing about finance other than that there were reportedly gnomes in Zurich) was assigned to a series with the working title The Money Programme (for which nobody ever came up with a better name). My first task was to help Terry choose the theme music (taken from a Jimmy Smith LP brought in by his secretary) and create the opening titles sequence, featuring banknotes of many currencies and formidable safes. I became Terry’s lead researcher, swiftly promoted to directing short films, and then – after watching a live transmission from the production gallery – the regular live studio director. That was the sum total of the “training” element in my “as if I were a General Trainee” career. After a year on The Money Programme, I was transferred to Panorama, just as its high profile editor, Jeremy Isaacs, was being squeezed out by the BBC hierarchy (he had dispensed with the traditional studio host, preferring all-film editions, and thereby earned the ire of the dislodged Robin Day). Panorama reached its authoritative peak under Isaacs: the likes of James Mossman, Michael Charlton, James Cameron, Richard Kershaw and John Morgan delivered 50-minute essays on film, offering a fluency of words and images that only Robert Kee (himself a recent departure from Panorama) could match on ITV. These reporters were paired up with Lime Grove’s top producers – Robert Rowland, Phillip Whitehead, Jo Menell and Jolyon Wimhurst. As we watched the senior film editor, Ian Callaway, effortlessly assemble emotive sequences out of the rushes despatched from Vietnam by Charlton and star cameraman Erik Durschmied, Jeremy asked to borrow my mini-thesis on public service broadcasting. I never established whether he read any of it, as he soon himself departed for ITV, as Head of Current Affairs and Documentaries at Rediffusion. His successor – David Webster – reverted to a magazine format for Panorama, though single-subject editions still appeared (I was one of two producers of a full-length profile of Richard Crossman). Awaiting Webster’s arrival in post, the Head of Current Affairs, John Grist, was holding the fort. It was Grist who buttonholed me on my return from the betting shop. “Go straight to Heathrow – there’s a flight to Tel Aviv – you are booked into the Dan Hotel.” Somewhat taken aback, I thrust a thick wad of banknotes into his reluctant hand, asking him to look after it till I returned, and then grabbed my overnight bag, checking that Andy and Francois had been alerted. Andy Mulligan had been a brilliant scrum half for Cambridge, Ireland and the Lions, but was even less experienced than me in terms of television reporting: but that actually worked in our favour. On the Thursday morning, the main Panorama team, led by Mossman, made its way south towards the Egyptian border, leaving my unit – accompanied by a cheery Israeli press aide – free to venture into the West Bank. That day and the next, we manoeuvred our way into East Jerusalem and the Old City. By a stroke of luck (or perhaps our press aide had done his job well) we were able to film at the Western Wall as the Minister of Defence, Moshe Dayan, Israel’s most celebrated general, made his way through clusters of uniformed combat troops celebrating the recovery of Judaism’s holiest site. I explained to Andy the blessing that Dayan and his soldiers were reciting as they pressed their foreheads against the Wall – the “Shehecheyanu” – the thanks that Jews give to God at moments of thankfulness, for having kept them alive, having sustained them and having brought them to this moment in time. Non-observant as I was, the scene was compelling and highly charged, only tempered by the sight of deserted Arab streets, where anxious teenagers sheltered in shadowy doorways. On the Friday, before sunset, we filmed an interview with Teddy Kollek, on the rooftop of his mayoralty building, looking out over a Jerusalem united under Jewish rule for the first time in nearly 2,000 years. For our last day of filming, we drove north through the West Bank, where mopping-up operations seemed to have concluded. Even so, the Israeli Defence Force had blocked many of the roads leading through Galilee, and it was only because I knew the area reasonably well that we found a route through minor paths, and even across fields, to a spot where we could observe the assault on the Golan Heights. Like the capture of the Gaza Strip and the Old City, the decision to seize this formidably-defended natural fortress – a constant threat to Israeli farmers in the fields below – had been improvised, and fiercely resisted. Back in the hotel, the public areas thronged with young Israelis, high on victory, demanding to know why Jews from Europe (like me) were not volunteering for military duty, or at the very least donating blood. I tried in vain to explain the basic rules of journalism. I can’t remember now whether our Dayan interview even went into the labs for processing. I was too shell-shocked. A month later, I was despatched by Grist to New York to assemble an edition on the city riots that were spreading across the US. Robin Day (who travelled in business class whilst I flew in economy) was my assigned presenter. I called both NBC and CBS to see if they could have a studio available on the Monday for a live discussion. Then I tried to book a freelance film crew to fly upstate on the Sunday to record an interview with Patrick Moynihan, who had served in the Kennedy administration and had written a noted (and notorious) report on the impact on African-American children of absent fathers. This proved to be a mistake, twice over. First, the cameraman I hired failed to locate a sound assistant, so asked his wife to operate the camera – which he locked off so that it could not pan, tilt or zoom – whilst he concentrated on the sound. More importantly, Sunday afternoon proved not to be the ideal time to interview Moynihan, who had consumed a great deal of alcohol before sitting down for his interview. The slurring of his words could just about be attributed to his distinctive accent, but his rolling in and out of shot – leaving the hapless wife monitoring a blank frame – seemed beyond rescue. Fortunately, “Cutaway” Callaway found enough edit points, whereby Moynihan rolled out of frame, and then back in again, to salvage a potential fiasco. Equally fortunately, the studio discussion, chaired by Day, went well. But I did not escape Grist’s displeasure. In confirming one of the New York studios I had approached, I apparently failed to stand down the other, and the BBC was being billed for both. As luck would have it, a real job – as an assistant producer – beckoned in another department, General Features: I was boarded, and appointed, helping launch two new series, Cause for Concern and People in Conflict. In fact, I devised People in Conflict, and was granted £500 to create a transmittable 50-minute pilot. The result was effective enough to earn a commission for a full series, and the job of producer was advertised. I applied, but was deemed too junior to occupy such a post (a radio producer, with no television experience, was installed). It was time to leave the BBC. Jeremy Isaacs had decided to recruit for ITV’s This Week series as many of Panorama’s personnel as he could, starting with Phillip Whitehead as the show’s new editor. In all, eight reporters, producers and cameramen were hired. By the time I was sounded out, the ITV franchise process was reaching its climax. Rediffusion TV had lost its sole status as the contractor for London, with the weekend being assigned to a new company, London Weekend Television, and the weekday contract to a forced merger between Rediffusion and ABC TV, which adopted the title of Thames Television. The militant TV technicians union, the ACTT, launched a strike to ensure that all Rediffusion’s employees were taken on by Thames before any new recruits were installed. Having resigned from the BBC, I found myself in limbo. Bizarrely, my first working day thereafter was as the director for the ACTT’s official camera unit covering the strike, filming my about-to-be boss, Phillip Whitehead, crossing the ACTT picket line. In the end, all the old Rediffusion directors were re-employed: and I was allowed to start work on This Week. Yom Kippur war. 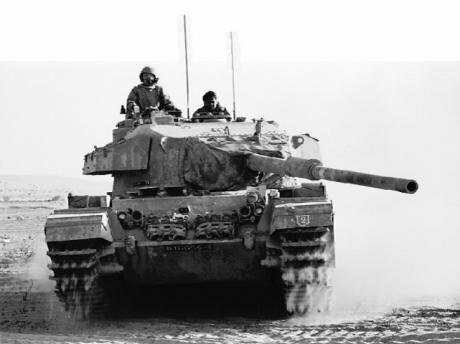 An Israeli Centurion tank operating in the Sinai.October 1973. Flickr/IDF. Some rights reserved.Five years later, I was back in Israel, for the Yom Kippur war. This was a conflict on a far larger scale than 1967’s: it was Israel that was caught by surprise as Egypt, Iraq, Jordan and Syria co-ordinated their attacks. Dayan was still Defence Minister, but both he and Prime Minister Golda Meir were discredited by their failure to anticipate the Arab assault. Eventually, some daring military manoeuvres, and a huge US airlift, allowed Israel to force an end to the fighting, but the mood was utterly different to that in 1967. There were no press officers this time to accompany my This Week unit, as we made our way up to northern Galilee, using the same back routes as I had negotiated in 1967. For the first time, I encountered shell-shocked Israeli soldiers, who had fought off a determined Syrian advance. Burnt-out Syrian tanks were nearby. After we had finished filming, and briefly paused near some trees so that Allan Segal, a World In Action producer who had come along for the ride, could relieve himself, a wire-guided Syrian missile came uncomfortably close to us, before hitting the ground 500 yards away. The next day, in a more exposed position a few miles further west, a car carrying British journalists was actually hit by another Syrian missile. The brilliant Sunday Times writer, Nicholas Tomalin, was killed outright. My last visit to Israel, in 1985, was to make a documentary about water rights on the West Bank – Whose Hand On The Tap? – in the course of which I realised that expectations of Palestinian autonomy were hopelessly compromised. It was not just that Israel would always exercise military control of what it called Judea and Samaria, but that the West Bank aquifers were Israel’s main source of fresh water, and Israel would always demand to keep them under its control. That control also allowed Israel to ration water supplies to all Arab towns and farmers on the West Bank, whilst ensuring that Jewish settlements had sufficient for water-hungry irrigation and children’s swimming pools. Even the frankest and most engaging of Israeli officials could not disguise the inexorable shift rightwards of Israeli thinking since the Six Day War – or, in my case, three day war. I have never returned. In 1968, Royal Palace won all five of his races, in true champion style. By then, George Moore had returned to Australia, and the latest Murless stable jockey was Sandy Barclay. Also by then, I had embarked, however briefly, upon a proper job at the BBC: I never backed Royal Palace again.